A hundred, fifty, or perhaps even 20 years ago, this idea would have seemed preposterous. Just imagine the Amazonian jungle, riddled with towns and cities – how can this be? Besides, if this was the case, then why haven’t we found any ruins, or other viable evidence? 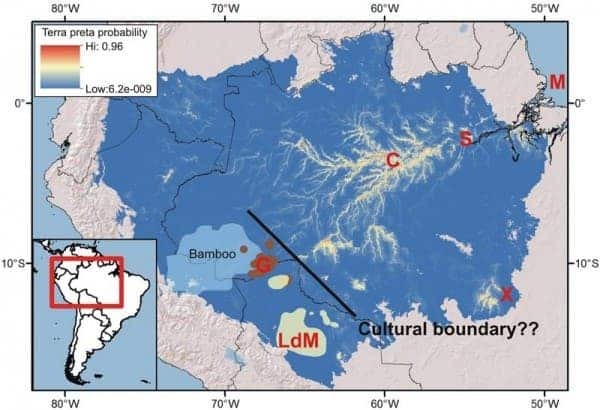 Still, more and more archaeologists are embracing this idea, believing that before Columbus arrived, the Amazon basin was actually a thriving area, with many populations, much more sophisticated and able to manipulate the environment than previously believed. The extent of human settlement in the Amazon is to this day hotly debated, as the huge 6-million-square-kilometer rainforest area remains mostly unstudied, due to the roughness and inaccessibility of the land. Now, a team of researchers have built a model predicting where signs of pre-Columbian agriculture are most likely to be found, a tool that can help archaeologists know where to look more exactly. It’s easy to fall in the trap of thinking that archaeology has more or less discovered everything there is to know (at least all the big things) – but that couldn’t be further from the truth. Amazon archaeology is still very much in its infancy. Archaeologists weren’t much interested in the area in the first place. It’s rough, it’s hard to breach, and the relatively few tribes that still inhabit the area can be very dangerous. Also, the soil is notoriously low quality – every nutrient is quickly assimilated by the astounding biodiversity – so it seemed safe to believe that agriculture couldn’t have possibly developed in the area – and without agriculture, you can’t really have significant settlements. But recently, they’ve found gigantic earthworks and ancient roads, which point at a vibrant, populated area. So what was the secret of the ancient farmers? Something we today call “terra preta”. 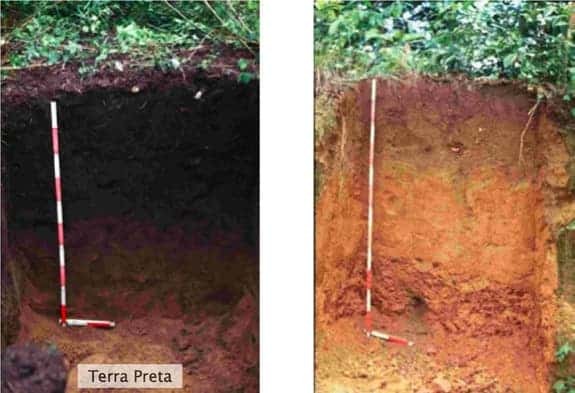 Comparison between terra preta and typical Amazonian soi..
Terra preta—literally “black earth”—is soil that humans have enriched themselves to sustain agriculture, providing it 2-3 times more nutrients than the soil around it. There is no fixed scientific definition of terra preta, but it is, as a rule, darker and richer in organic matter than surrounding soils. It’s not entirely clear how they enriched it, but it does tent to have charcoal and pre-Columbian pottery shards mixed in. So if you could somehow identify all the terra preta areas, you have a very good chance of finding all the big settlements. Crystal McMichael, a paleoecologist at the Florida Institute of Technology in Melbourne analyzed data from over 1000 known terra preta sites and comparing it with information from soil surveys that reported no terra preta, she found consistent distribution patterns. They were ultimately able model predicting where undiscovered terra preta sites are most likely to be found. They came to the conclusion that a staggering 154,063 km2 of terra preta in the Amazon, composing about 3.2% of the basin’s total area – this is only an approximation based on the model, of course. “Within a forest of almost 6 million square kilometers, it’s hard for archaeologists to determine site locations for sampling,” she explains. Like the increasingly popular LiDAR—which can find earthworks hidden under the rainforest canopy but can’t sniff out terra preta—“these [statistical] methodologies narrow down the probabilities” of where to find promising archaeological sites. In September 2013, a Finnish archaeologist made a stunning discovery, revealing signs of a unknown ancient civilization in the Amazonian area, unearthing several unique artefacts, including entirely new forms of ceramics. Hopefully, using techniques such as this, in conjunction with the development of remote sensing, researchers will soon be able to direct archaeologists to more and more exact places, so we can start digging up the history of the people in the Amazon basin – literally.